Egyptian Muslims have returned to "business as usual," with another attack on a Coptic Christian church, this one in Aswan. Egypt is back to “business as usual” with the Islamic majority harassing and attacking its Christian minority. A group of Muslims burnt down part of a church Friday – the Islamic Sabbath – in the village of Marinab, according to a report published in the daily Al Masry Al Youm. The village, situated close to the town of Edfu in the Aswan Governorate, is located some 800 kilometers south of Cairo. Security sources said Muslims rampaged through the village in what appeared to be a pogrom, clashing with the Christian residents and destroying their shops. 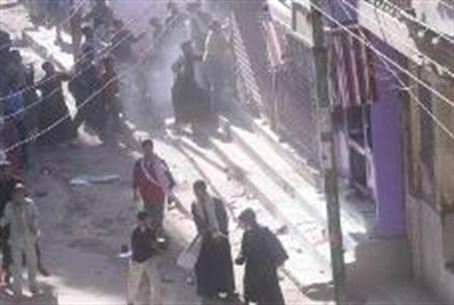 Central Security Forces cordoned off the village “to control the clashes,” according to the newspaper report. Christian websites reported in September that a group of Salafi Islamists had threatened the Christians, warning them not to leave their homes in the village unless they first removed the church dome. Saint George's Church had been restored earlier in the month, according to the report. A gang of Salafi Muslims boasted to a victim they were torturing in March, “We won't leave any Christians in this country,” according to a report published several months ago in the Wall Street Journal. The attackers were never arrested. The phenomenon of Muslims attacking Coptic Christians in Egypt is not new. But during the Tahrir Square Revolution that unseated former President Hosni Mubarak in February, protesters claimed the “new order” would bring peace and equality between the country's majority and minority populations. But although intentions may have been positive among the organizers, the rank and file have since returned to their roots. Since the revolution, there have been numerous murders by Muslims visited upon the Coptic Christian community, which comprises about 10 percent of the 83 million-strong Egyptian population.